Last Saturday we decided to walk the kids in the afternoon, at 4 and 6 years they need plenty of exercise and if they don’t get it – well let’s just say that being at home is not that pleasant! You would have thought that the two hours of solid football would have done the trick but oh no, not our boys, they still had bounds of energy to disperse. 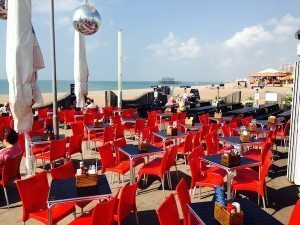 We took them along Brighton seafront as it was a lovely afternoon with the warmth of the bright sun regularly breaking through the clouds, a mild temperature for this time of year and plenty of happy people making the most of this glorious day. The boys were starting to show signs of tiredness (YAY!) and starting to ask what we had for tea. 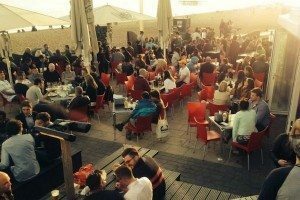 We had commented earlier on the bustling crowd sitting outside of Oh So Social and as it was just a minutes walk away – we decided to take the boys in there and try the burgers. Although we were tempted to sit outside the containment of a booth won us over and we sat the boys down whilst we sat at the end to avoid them escaping……….their not that bad really – but better to be safe with two large glasses of Luis Felipe Edwards Chilean Malbec on the way! Inside was not as busy, which for us was quite nice with the children. There’s a stainless steel bar to one side and booths that line the opposite wall. 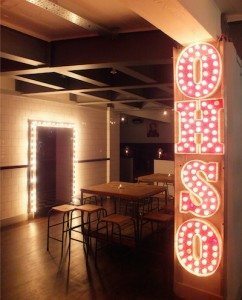 There’s a small partition wall up the centre of the room which is open at either end with big lights displaying OHSO and works as a good divide between the bar and eating area. The booths are mock leather and the tables are big enough to fit 6 adults comfortably. The front is mainly floor to ceiling glass allowing you views or access to the sea and the crowds outside. The waitress was friendly and not at all fazed by the boys attempts to escape and run around the restaurant. Thankfully she found them funny and went off to get them some pens and paper whilst we decided on food. The menu does not baffle us with choice, this is a good thing as we haven’t really got time to sit pondering for hours whilst our children evacuate all the happy punters! There are fresh white bread sandwiches with either sussex ham, mature cheddar and Branston or a grilled chicken, mayo salad doorstep – all served with homemade coleslaw. There’s a selection of burgers and toppings, Irish mussels in a creamy bacon sauce with rustic bread, classic fish and chips or various salads if you fancy fish or something lighter. We ordered a mezzé type starter for us all to share and the kids were chuffed with their menu which had 4 options. Our eldest chose the fish and chips and our youngest decided (very quickly) on sausage, chips and beans. Mr C went for a grilled chicken burger with crispy smoked bacon and sussex mature cheddar; whilst I went for the hearty 8oz locally sourced beef burger and chose homemade chilli and mature cheddar for my toppings. 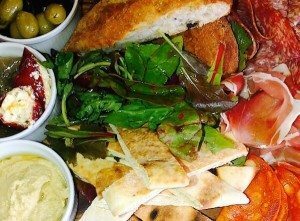 Our starters arrives – a meat antipasti board with serrano ham, Milano salami, sliced chorizo, stuffed bell peppers, marinated olives, houmous and mediterranean roasted vegetables, pitta and olive breads. How can 2 young boys achieve what a plague of locusts can in under a couple of minutes? To say they enjoyed this starter is an understatement but me and Mr C did get a little look in. I thought the olive bread, which was warm and soft was delicious and all the different meats were fresh to look and taste. This is a great sharing platter and one we would have again. The Malbec was going down very well, this is a hearty but smooth wine and we soon realise we should of just ordered a bottle, so we order another glass when our mains arrive. The boys have good portions and I start to get food envy as my 6 year old starts “MMMMMMing” whist eagerly tucking into his fish and chips. It quickly becomes clear that they serve good quality fresh food – no fried brown cafe type sausages here! 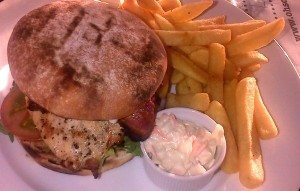 Mr C is delighted with his chicken, bacon and cheese burger, I have to try it and agree this is very well done…..the chicken is juicy and the salad is all very fresh and tasty. My burger is of mammoth proportion, smothered in chilli and melting cheese. I must confess, I really misread the chilli bit – assuming this would be a homemade chilli jam and not realising this meant proper chilli – the sort you would normally get with rice and sour cream. I will say that any meat lover who’s hungry would be happy to make the same mistake, as this was a very tasty meat feast. 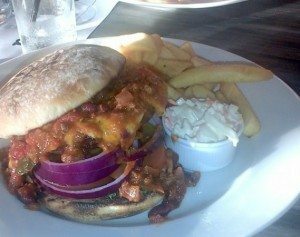 The burger is 100 percent ground quality beef and was cooked medium to well, the chilli is delicious – slightly spicy and the fresh white toasted bun is holding its own; which considering it’s contents is quite an impressive feat! These are good burgers and excellent chips too. They are a bit like the ones you’d get from a good chippy, thick cut, not greasy and slightly crispy on the outside. Altogether with the homemade coleslaw; this is a really good combination and one that will not leave you hungry. The boys are happy and we all clear our plates – we were all absolutely full and couldn’t even think about cookies, cake or flapjacks for dessert. All in all this was a very successful meal which even left the kids a little slower than when they arrived! The menu is reasonably priced, not expensive but not cheap with sandwiches for £5.00, mains all around £10.00 and bottles of wine between £15.95 and £21.50. Me and Mr C will definitely go back for one of their breakfasts – which they serve between 9 and 12 as we like the idea of a crisp winters morning by the sea – blowing off the cobwebs with a hearty good quality breakfast…………sounds better without the kids! Their Christmas lunch menu’s were on show too, these sounded very appealing and reasonably priced… that reminds me! Yes, Oh So Social is very social on many levels, whether this may be for a family tea, a boozy lunch or even a private party.